Browse to your webmail site (i.e. webmail.test.com). This will present you with a login page. From the main login screen, you will type in your email address in the Account Name field, and password in the Password field. Click Enter. Once logged in, you will see the main Home Screen view. This view will allow you to navigate the different screens of the Communigate system. When you open an email, you will see the following options at the top of the message. If you hover your mouse over these icons, they will provide a description of what the icon does. 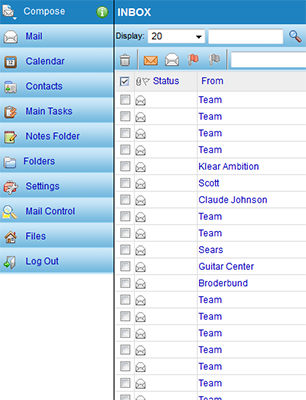 From here you will be able to see your folders in your email, including any folders you had previously set up. You will also be able to see your Sent and Trash. You can view your contacts from clicking Contacts on the left side of the main home view, or by clicking on Contacts under Folders. Your contacts have been imported over to the new Webmail platform. When in ‘Folders’ mode, on the top of the left side menu you will see in this order shortcuts for: New Mail, Settings, Rules, Files, Help, and Log out. You can add in your contacts to the email by simply clicking on the person icon in the green shirt. This will bring up a list of contacts, as pictured below. You can use the green arrows to navigate the current calendar you are viewing. You will also notice the ability to zoom in and zoom out. When you select the “Add Event” tab, you will see a “Compose Event” screen pop up. You will notice the ability to email the event to others you want to be invited. To the right you will notice the ability to set the time and duration of the event. You can add an attachment to the invite by clicking the “browse” tab. Rules are settings that perform actions automatically to specific messages such as store the message into a specific folder, or automatically delete a message. To create rules, go to ‘Folders’ then select ‘Rules’ on the shortcut on the top left corner. In the case above, all messages from ‘promotions@email.ntb.com’ should be stored in the ‘Special Offers’ folder. Once you enter all the information you needed, click on the green check mark on the top left corner, the message ‘rule updated’ will show.